I think it is very important for everyone to know how to give a goat a treat. This way you will all be prepared if you come to visit me. 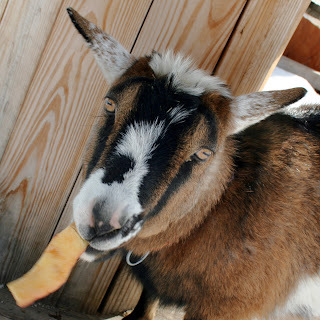 But I am NOT a piggie goat. That is a lie spread by Abby. Any you don't have to bring ALL of those things. One or two is fine. I am not greedy. I thought you should be goatucated though. On what I love to eat.